Really tasty fish and chips last evening at Ward 6 on Payne. I’ve been trying fish and chips at a lot of places over the last couple of months, in Saint Paul, Minneapolis, and Charleston, SC. Oddly, I haven’t found a great place in Charleston yet, but even though they’re oceanside, Charleston is more “low country cuisine”, which doesn’t seem to be my thing. 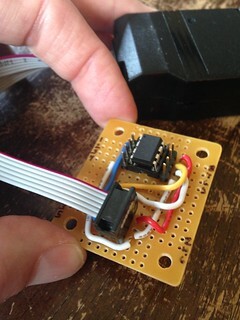 Will and I have been working on some electronics fun, mostly because I wanted to try this Instructables using a microprocessor. Of course, this was one of those things where you need to complete some projects in order to do the project. 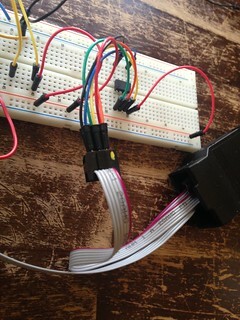 In this case we needed to build an AVR programmer so we could program the microprocessor (an ATtiny85). 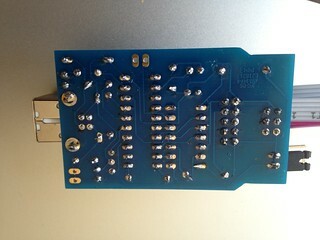 Building the programmer was fun, and Will did a whole bunch of the soldering! …and the trashing began. 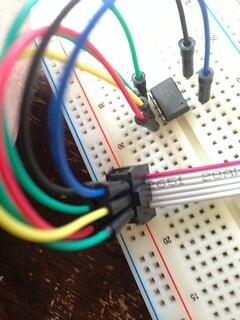 It turns out I didn’t understand how to read the pinouts from the programmer. But once we got help and re-wired and re-tried, we finally got it working! We were able to make our NeoPixel Ring do cool things via this nice code. 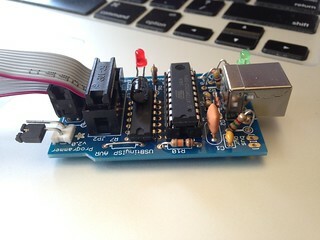 …which let’s me program and test easily without a bunch of jumpers and without having to keep moving the chip back and forth. Pretty sweet, and cost about $2 in parts (the board was $1.25). Pretty nice. Full enough. Resteeps up to twice nicely. Next up: Scottish Breakfast from TeaSource. I had a hard time of fruitless Googling trying to find how to fix my subwoofer. Turns out it’s very easy. Here you go. You’re welcome. In case the URL goes bad one day, turn off the sound bar, plug in the subwoofer, stick a paperclip into the “ID Set” hole on the subwoofer and hold for five seconds, then press the mute button on the remote for five seconds, then power up the sound bar. I had a bear of a time getting an older iPod Mini to mount. It worked on my laptop, but not on my Mac Mini. Restoring didn’t solve. Turning off both “Manually Manage…” and “Enable Disk…” on my laptop fixed it for the Mac Mini. $20… 20 minutes… happy repair. Recently the weather was a bit odd; extremely humid and warm for winter. It turns out that apparently this does very bad things to our phone line. Our internet has been terrible; phone calls nearly unusable. That just me holding my iPhone next to the phone receiver. On a clear dry day, it’s quiet and normal. So, of course we called CenturyLink. They sent someone out… two days later. Yeah, weather had cleared. Yeah, “everything was fine”. Sigh. Happening again today. Called again today. They’ll send someone out… Friday. Really, really frustrating. Not sure I have any hope this will ever be fixed, unless we just get “lucky” and have humidity problems that coincide with a technician visit. UPDATE (6 days later): As far as I can tell, the technician never came last Friday. Voice line still sounds just as bad. Terrible internet. UPDATE (6 days and a few minutes later): Checked “Where’s My Tech” and it turns out my December 26th visit got quietly moved to December 30th. Sigh. UPDATE (6 days and a few hours later): Yep, it happened. Over the last few hours humidity dropped to 60% and the line is clear, voice and internet. Both were unusable 3 hours ago. So grumpy. UPDATE (yet later on the 29th): Clear voice line and seemingly good S-to-N on the modem, but modem reports connection speed is about half of what I pay for. UPDATE (Dec 31): Well, no one showed up. Again. The “commitment” to Dec 26 became a “commitment” to Dec 30 and is now a “commitment” to Jan 3. UPDATE (later on Dec 31): Nothing much interesting, but did see a SNR of -5 dB… haahaha! UPDATE (about 4pm on Dec 31): Some progress! @CenturyLinkHelp jumped in and a couple of hours later a tech called me saying that he’d found and fixed bad wiring on the phone pole. Voice line seems clear now, as does SNR, but DSL speed is pretty low, so a little more work to be done. REPOST: I just found this while consolidating my old backups. It’s from 2001. Winter came late this year. It was so late, I was able to get my Christmas lights up the way I’d wanted to for years. A few strings on the house, a few in the corner bushes, and some on the garage. Much better than previous years’ last minute attempts. They looked great. A few days after they’d been put up, I found that the string on the garage and fence wasn’t working. Upon examination, I found the lights had been vandalized – cut in three spots just as they transitioned from garage to fence. Our family was angry and sad that someone would want to wreck what we thought was just a sweet Christmas tradition; being vandalized is intrusive enough, but Christmas lights! The lights shone that night, and the night after. The next day, however, brought an unhappy surprise. Looking out the kitchen window, I saw some wires hanging on the fence. He’d come back. Now I was really mad, and I went out to examine the damage – it was worse. Instead of a simple cut which was easy to repair, the vandal this time chose to remove sections of the wire; sections with the light bulbs and sockets (these were the larger C-5 lights). I couldn’t just pull this together and tape it. I had to take down the string and repair it indoors and replace it outside. This seemed too smart for a really little kid. Someone really wanted to make sure those lights didn’t light. I defiantly repaired the string and replaced it on the fence – the lights will not go out. I also had an idea. At first I wanted to wait in the minivan for the creep to show up and catch him in the act. I had my list of suspects and couldn’t wait to get whoever it was. Then I realized that my new camcorder will record in extremely low light, so instead of waiting all night, I set up the camera in the kitchen window and ran it while I slept. I was now hoping that I’d wake up to see they’d been vandalized again. I woke up and the lights were untouched. Same for the next night. Then, again, the lights were vandalized, and this time it seemed to have happened during the day! Unbelievable gall! This time one bulb was smashed in and the wires in the bulb crossed, blowing the fuse and disabling all the lights! This kid is smart! It was, I had to admit, a brilliant and efficient way to bring down a whole string of lights. But the lights will not go out. The repair took only a few minutes. Now that this seemed to be done during the day, I’d decided to set up the little creep. The next morning my wife would take my boy to school in the minivan, leaving the driveway empty. I would be at the window with the camcorder in the darkened house. Once my wife got home, I dejectedly decided to go in to work, and as I left, I made the discovery that broke the case. So much for my Sherlockian skills. What I saw when I left for work was that squirrel on top of the fence nervously holding an orange bulb. He stared at me for a moment, and dashed into his nest atop a tree right next to the fence. I laughed for a long time that day. Our family got to do the first Sunday Advent reading at church, which is not particularly noteworthy, but what is pretty fun is Nellie’s participation. I think she had it pretty much memorized, but nevertheless, she was carefully reading it word by word… and she’s a very new reader. More proof I was born in the wrong era; a nice message from my favorite old time radio drama. This was regular, commercial radio.